We’re settling in and adapting (somewhat) to the heat and humidity and have at least some part of a plan for the terrible noseeums in and around the marina. We’ve figured out they mostly they swarm around dawn and dusk, so we’ve learned as soon as we see/slap more than an occasional pest to immediately run and close every door/window in the boat. Works great for stopping the maddening bites, but obviously not great for airflow or temperature control onboard! That made the decision of initial projects easy. While we never thought we would use them… the boat came with air conditioning units. We haven’t been able to run them because of our burnt/melted shore power connection, but it suddenly seems like a good time not only for a fix but an upgrade. Absolutely everyone i’ve spoken to suggested putting in smartplugs, to help prevent exactly the problem we had with our shore power. 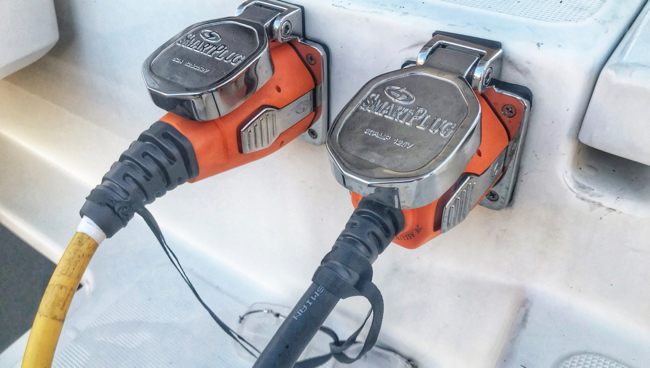 I had seen these when doing van research, but since we never connected to or added shore power to our van we never needed them. Now they seem like a lifesaver. 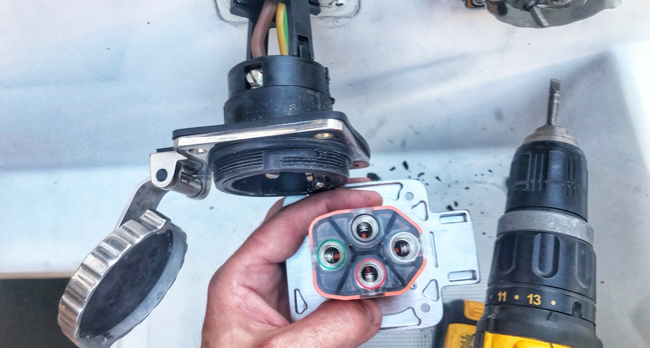 Easy install other than figuring out which wires to convert from US to european wiring (our boat is french). This was of course made worse by the fact that i could figure out why our existing plug had a black wire when the euro standard is blue. Finally ripped the cable out far enough to see that the black wire in fact start out as blue, but the burning/charring went so far up I couldn’t tell. Yikes! Still amazed we have a boat left to move onto… but feel great about the upgrade and can sleep well knowing the boat wont catch on fire (or at least is far less likely to). Oh…and I cant lie- in those hours where we have to shut down the boat to avoid the biting swarm… the a/c is simply luxury. We’ve also been tackling other projects as we can and the company we hired before arrival to do the big upgrades (mostly safety stuff… radar, AIS, communications, etc) comes and go a few times every day to try to wrap things up. We swapped out the AGM battery bank with Lithium Batteries. We know well from our time living offgrid in the van how essential this is. A big price tag upfront for sure…but far better for our lifestyle and the longevity of the batteries themselves (we don’t know how long we’ll be out there). In this case we went with LifeBlue Dropin batteries because they fit the tight compartment we had but still allowed us to ramp up to 800ah of battery. Hopefully soon we’ll be adding solar to top those babies up! Let’s see… there are countless other projects going on simultaneously at all hours. The list(s) seem impossibly long and we both find ourselves easily distracted because by the time to you go grab some tool or part for one project you see something else that has to be done and start doing that instead. It’s madenning, but we are actually checking things off the list, so thats great. No question we have a ton to learn. Somehow we thought it was just going to be sailing that was difficult… but right now it’s like we can barely figure out how to turn the lights on or flush the toilet (or where that power or water comes from when we do). These projects and simply living on the boat are proving to be a crash course in boating 101. And who knows- maybe some of this knowledge transfers to other boats (in case we ever have one) or maybe it’s all so unique to this boat that we would have to start over. Right now I feel like we’re in kindergarten but the college mid-terms are next week! We are also still running errands/shopping every day. The traffic here doesn’t make that easy, but the highlight for us is any task that can actually be accomplished by boat. The waterways here mean some of the shops can be reached by dinghy. A good chance for us to test that out (continuing our philosphy of learning/trying one new thing a day)! I’m certain that this doesn’t seem like a big deal/step to most people… but neither of us grew up in homes with boats or near the water… so taking the dinghy out seemed HUGE. We taught ourselves to drop it in the water, how to start the outboard and finally even how to steer in the general direction of where we intended to go (that one’s going to take some refining)! In this particular case, as irony would have it- we took our dinghy a few miles inland to look at, you guessed it- a dinghy! Our dinghy seems fine to us, but everything we have read about sailing the caribbean makes it clear that your tender (dinghy) becomes your daily driver. It-s how you get to and from everything from shore to divesites, you need it for work on your boat or in an emergency and you want the biggest/best one you can fit on the boat.